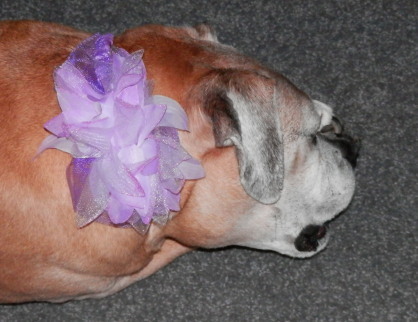 Please help Diane and Miss Gracie celebrate Di's 1000th blog post. Visit her blog at www.quiltingisblissful.blogspot.com. She has an unusual and exciting idea for the celebration. Let's all join in! 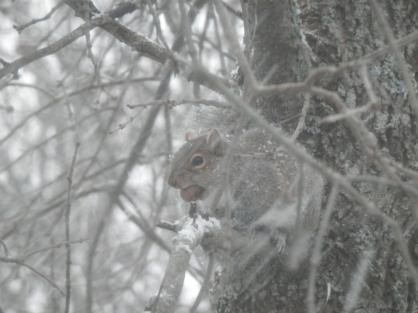 Taken today, in the tree outside my sewing room. Our first really measurable snow, but not too much. I spent the day hand quilting--pics probably tomorrow. P.S. I am listening to XO by Jeffery Deaver. The decision was made to forego the pictures tonight or there still would not be a post. It's not that I'm not working on things (I am) but just no progress worth pictures. Outside things look drab and brown, sometimes with a touch or two of white. Not being overly fond of browns (no offense to you brown lovers out there), I am still surprised at how much I love Peewee. I need to find the perfect backing fabric and get it basted and quilted. Right after I finish quilting and binding the skull hexagon quilt, and make a wedding quilt for a couple who just celebrated their first anniversary, and finish...finish...finish. Oh, my. On an unrelated note, have you heard "That's Why I Pray" by Big & Rich, from their Hillbilly Jedi album? I love the video that goes with it and just downloaded the song to my Kindle. What? I didn't tell you I have a Kindle? Yes, a Kindle Fire HD. And a gift, no less! If it's even possible, I am reading more. I carry it with me everywhere and read even for a minute or two when I am waiting somewhere. It is so majorly cool! Tons of free books to download, plus you can download samples of books to see if you like them before purchasing (obviously not for the free ones!). I don't mind not turning real pages and I can read even in a power outage. I can recharge the battery in the car! Okay, back to Big & Rich. LOVE this song, know almost all the words already and the message keeps running through my mind. It is so much a message for today's world. Check it out. Did everyone have a wonderful Thanksgiving? Ours was small but great. I remember when we had almost twenty people around the table, the kids sat in the kitchen and the men all went hunting before dawn, coming in just in time for lunch. So many people absent--but not forgotten. With families spread across the globe, it is harder to get everyone together. Think what it must have been like in our grandparents' time--when families often were in the same town and getting together wasn't like marshaling the troops. I wonder what young people in our time will remember when they are older? Are you all asleep yet? If so, I will market this post as a cure for insomnia! The entire piece is only 16.5 x 17.5, including borders. Each hexagon finishes at 1.5 inches per side. 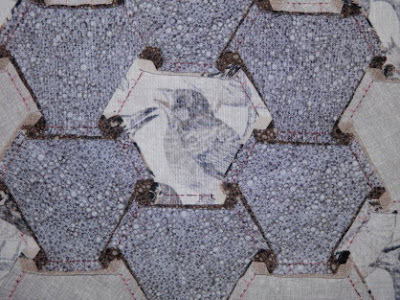 There are half, corner and side hexagons to make the piece "square" again. And borders. There's Peewee! I had the title not long after I started cutting the fabric. 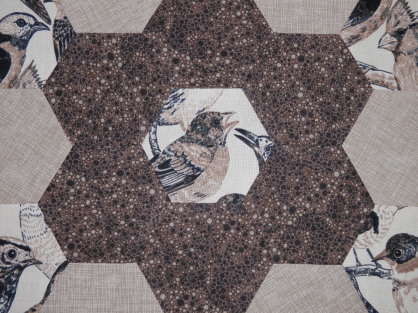 I cut a lot of hexagons of many fabrics until I found just the right combination. See the birds around the center? Ever-watchful of Peewee. Here's the piece from the back. Carefully pressed and trimmed to reduce bulk and prevent shadowing. This will be a class for both shops and guilds in 2013. I will be updating the website soon to include this full day class. 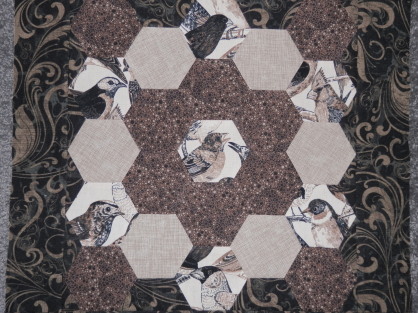 Then you too can claim a finished hexagon project...in this lifetime! Hope everyone had a wonderful Thanksgiving and traveled safely. 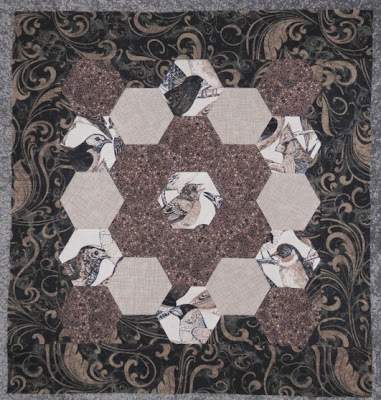 This runner was cut, pieced and machine quilted in about three hours. Even the binding was on, except for the hand sewing. But I just couldn't seem to find time to sit and hand sew that binding! This is created with the Whirligig ruler/template by Creative Grids. One template, easy sewing, minimal matching--you could have several done in time for Christmas. Yes, this year! And the pattern is included with the ruler/template. I have a second center done. Just need borders. All batiks, as is the one above. The weather here has been wonderful. 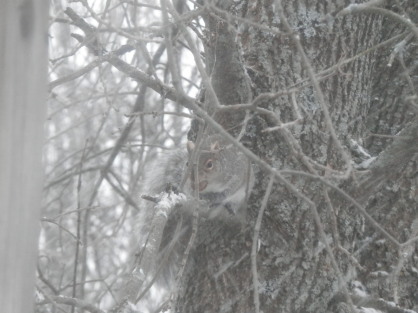 Although I know I can't stop it, I am dreading the first big snowfall. The snowblower is ready and the shovel is by the door, but I'm grateful for every day without major snow. You should see Protecting Peewee over the next few days. The center is hand pieced and just needs trimming and a border. I love it and it turned out just as I envisioned. That's it for now. Happy Thanksgiving, everyone! 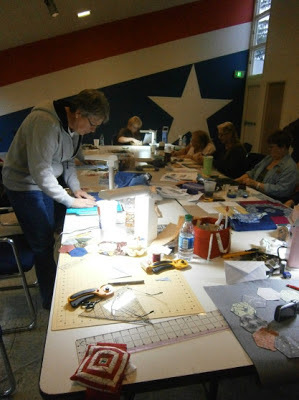 Have you noticed lately that English Paper Piecing is having a resurgence? Well, I love to baste over the papers, but hate to whip-stitch those pieces together! I love hand piecing, so I thought why not just mark the pieces and stitch them together that way? 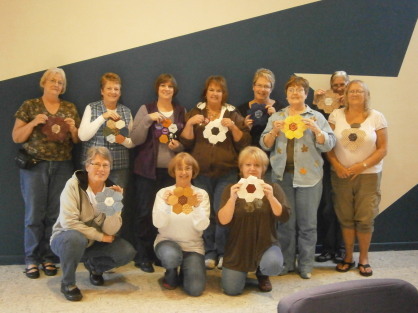 So a do-able hexagon project was devised and the ladies in the Corning area got first crack at it. Today we spent learning something new, laughing lots and having a ton of fun while doing it! Here's a shot of my sweatshop class. So serious, learning the ropes. Attentive to every nuance of this blissful endeavor. Oh, the things they learned--from why a shark does not immediately attack a raft loaded with people to choice of fabrics, threads, etc. At the end of the day, the results. Some are doing the traditional setting, some are doing a more random presentation. I love both. And the choice of fabrics makes each piece sing. Several of these ladies were first-time hand stitchers; you couldn't tell it from their stitches--just wonderful. What a fun day! Thanks so much for inviting me! I can't wait to see what these grow up to be! Just look at these smiling faces! You've seen them before with other finishes and this one is just as stunning. 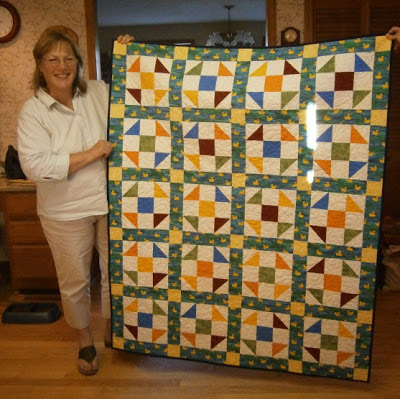 Debbie and her mom, Grace, hand pieced and hand quilted this lovely piece. The pattern is from Monthly Bliss 1 (designed by yours truly!). Debbie and Grace work as a team on most of their quilts, and Grace loves to hand piece. In fact, she's made several quilts' worth of several of these blocks for other projects. She is also the hand quilter of this gem. 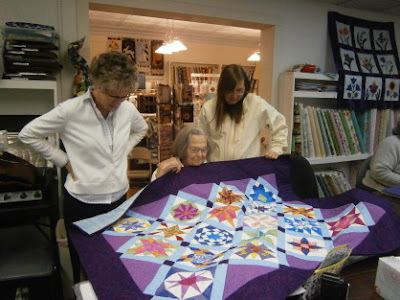 The class was held at O'Susannah's in Watkins Glen. That's Sue, the owner, on the left taking a look. 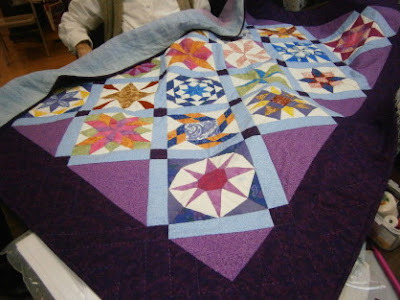 Here you can see a bit of the quilting and a close-up of the blocks. Can we say "proud"? Yes, I am! Well done, Ladies! I've got a new hexagon piece cut out which I will show as it progresses. The name? "Protecting Peewee". Intrigued? P.S. I just finished listening to Fool Me Twice by Michael Brandman (for Robert B. Parker) and am starting Delusion in Death by J.D. Robb. 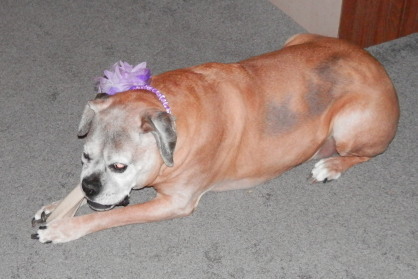 Saturday, November 3, was Lynnie's tenth birthday! That's a big milestone for a boxer! 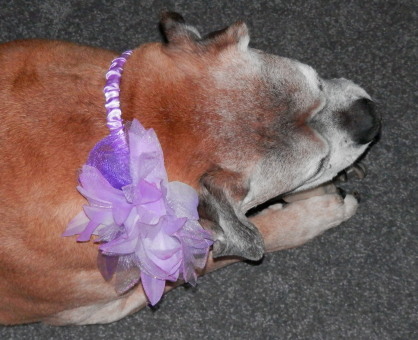 We celebrated with a special Busy Bone and I let her wear one of my "tiaras". She is such a good girl and I love her dearly. Every day with her is a gift. Happy Daylight Savings Time to all who change the clocks. We had snow yesterday and today, but luckily nothing major. 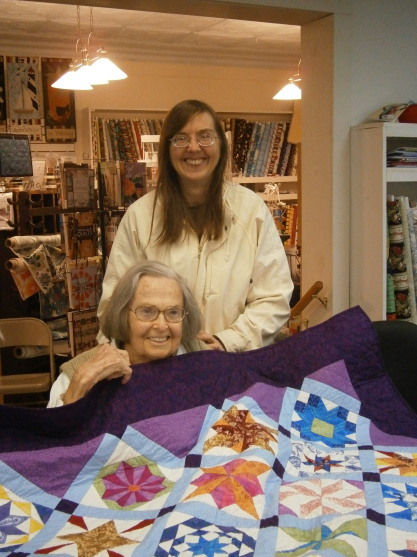 Over the summer, another of our quilt group's members found out she was to be a first time grandma. So...you guessed it! We made another quilt! Terry's face was priceless when she realized we were having a surprise party for her, and we made most of the blocks that evening. You may remember the shoo fly pattern (under patterns on the left side bar). This time we made it with Eric Carle fabrics. The front is sashed with 10 Little Rubber Ducks fabric. 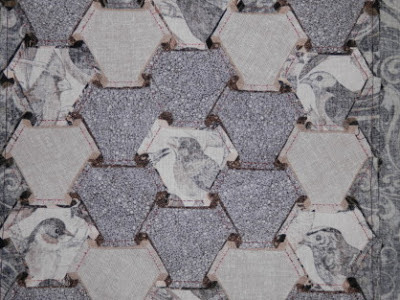 We chose coordinating prints from a variety of manufacturers to piece the blocks. The backing is another Eric Carle fabric, from the Grouchy Ladybug line. 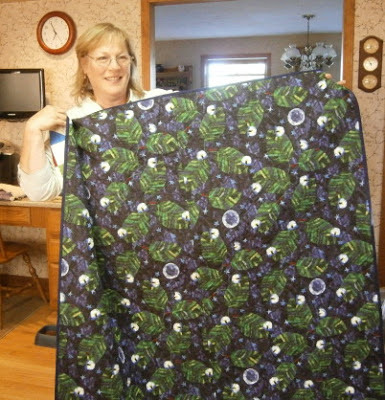 It was machine quilted by our friend Debbie. Perfect for snuggling with that special little one! P.S. Is everyone okay after the storm? I just found out today that a tree came down on a friend's car! Luckily she wasn't in it! P.P.S. I am listening to The Bone Bed by Patricia Cornwell.